I first visited Kennett Square on one those epic Couch family car trips back in the 1970's. It then felt more village than town. Mid-Atlantic rural and with an economy centered almost entirely around one crop--white button mushrooms--that were grown in microscopically small family farming operations. The farming, such as it was, took place in half-buried root cellar-style buildings. When we stopped at a family's farm to buy some mushrooms, the teenage son manning the family's stand let us tour their 'mushroom nursery'. He said he wasn't really allowed to do this but I think he was just too embarrassed to say 'no' to my mother, whose curiosity was greater than her disinclination to put a young person on the spot in this way. In we went and though it took all of about 5 minutes, the image has stayed with me ever after. Not because it was so interesting or beautiful but more because it was just so simple--such a simple way to make the earth yield up a living. I am sure it has changed since then in scale and in every other possible way but that day it felt every bit as quaint and exotic as farm life always seems to be in fairytales. So why Kennett Square today and all these years later? Honestly, it has absolutely nothing much to do with that long-ago day except that for me I can never think of Kennett Square without thinking of both the mushroom farms and of its other extraordinary claim to fame--Longwood Gardens. 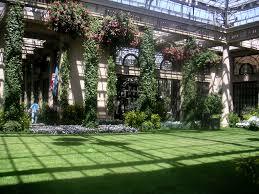 And trust me on this, just the thought of Longwood Gardens is a positive tonic on a day like today. Longwood is beautiful any time of year but to step into that conservatory, that mammoth gorgeous, heavenly (heaven-like?) conservatory is to be relieved of the weight of winter and possibly all the other weights of this world. I always think of Longwood on a day like today. Longwood is easily reached from Philadelphia, Baltimore or even D.C. so please put it on your itinerary next time you head up the eastern seaboard. But it's frigid now and it's post-holiday now and, speaking for myself, I could use a vacation from a thousand small winter worries now--so I say 'why wait'? What we need are some photos now. Without further ado and courtesy of the ever-obliging internet are some images from this magical place.